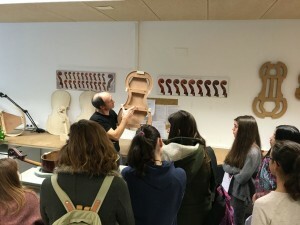 Last january 29th we received the visit of students and teachers of the bowed string department from the Conservatory of Music “Pablo Sarasate” in Pamplona. Students and teachers from BELE guided the visitors through the violin, viola and violoncello making workshops, the acoustics laboratory and varnishing room. These young players also took part actively in a “tasting” of instruments, assessing sound and the their different technical aspects. It was really wonderful the interest they showed and how activelly did took part. A truly rewarding experience both for BELE student and teachers.